The Malta Maritime Authority is investigating a collision between a Maltese-registered oil tanker and a container vessel off the Dubai coast. 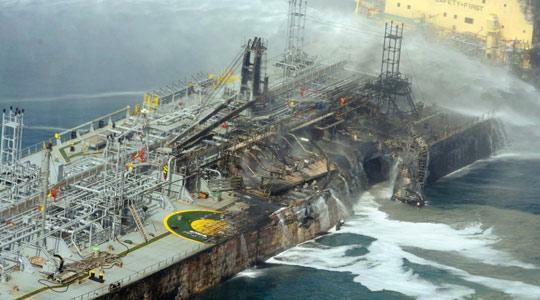 The MV Kashmir, which was carrying around €7 million worth of petroleum products, was extensively damaged. The oil tanker that collided with a cointainer vessel off the Dubai coast on Tuesday was a Maltese-registered chemical tanker carrying around €7 million worth of petroleum products. The Malta Maritime Authority said the tanker, MV Kashmir, and the container ship Sima Saman, registered in Singapore, collided because of restricted visibility in the morning in a busy shipping channel between five to eight miles off the port of Jebel Ali in the United Arab Emirates. The authority said it was told two tanks on board the tanker were ruptured and the two ships caught fire. The fire was put out and both ships were anchored safely off the port by the evening. No casualties were reported but two of the container ship's crew had to be lifted out of the sea and suffered slight injuries. No pollution has so far been reported but it appears the tanker might have lost some of its cargo of condensates after seawater leaked into its tanks. Condensates are light oils prized by refiners and petrochemical firms. The authority is investigating the crash through its appointed inspector in the country. Dubai, part of the seven-member UAE federation, is a small oil producer, pumping less than 100,000 barrels per day. The UAE is the world's fifth-largest oil exporter with current output of around 2.26 million barrels per day. Most of the UAE's oil is located in the capital Abu Dhabi and oil industry sources said the fire did not involve any of Dubai's offshore oil platforms. In September, a helicopter crashed into an oil rig off the coast of Dubai, killing all seven people on board and forcing the closure of the Rashind oil field.